Advair Side Effects: SIDE EFFECTS that may occur while Advair include hoarseness (dysphonia), throat irritation, headache, cough, or dry mouth or throat. If they continue or are bothersome, check with your doctor. CHECK WITH YOUR DOCTOR IMMEDIATELY if you experience white patches on tongue or mouth, or if your mouth/tongue becomes swollen and painful. CONTACT YOUR DOCTOR IMMEDIATELY if you experience any of the following unlikely but serious side effects: weight gain, vision changes, trouble sleeping, tremors, seizures, severe muscle weakness or cramping, fast/irregular heartbeat, numbness or tingling in hands or feet, chest pain, or worsening of asthma symptoms (e.g., increased difficulty breathing, wheezing, coughing). 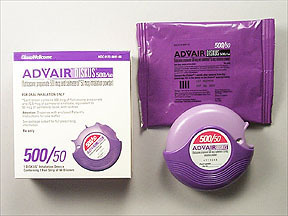 AN ALLERGIC REACTION to Advair is unlikely but seek immediate medical attention if it occurs. Symptoms of an allergic reaction include rash, itching, swelling, dizziness, or trouble breathing. Rarely, your wheezing might actually increase immediately after using this medicine (paradoxical bronchospasm). If this occurs, use your "quick-relief" inhaler (such as albuterol). Seek immediate medical attention if your breathing does not improve at that time. If you notice other effects not listed above, contact your doctor, nurse, or pharmacist.